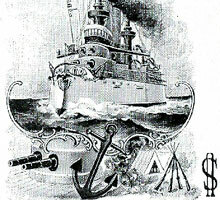 Russell, Morgan & Co produced both “Army” and “Navy” decks as part of their original range in 1881. In order to reduce costs of maintaining two separate brands they were subsequently merged into “Army & Navy #303” in c.1884. The Russell, Morgan and Co. became the United States Playing Card Company in 1894 and over the years eight different Aces of Spades were used with this brand and the Joker was also modified several times. The brand was eventually phased out in 1931. 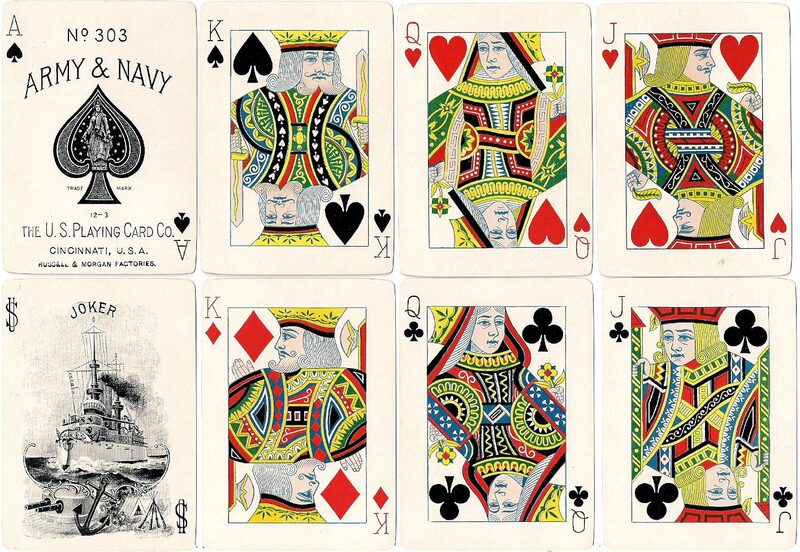 Above: “Army & Navy #303” brand playing cards published by the United States Playing Card Co., Cincinnati, in c.1900. This version has a Navy style Joker and a plain Ace of Spades with the subtitle "Russell & Morgan Factories" at the bottom. These particular court card designs were the basis of those used by Waddington's in the 1930s. Images courtesy Rod Starling.